I've been watching the evolution of pellet guns for the last 30 years with limited interest. Well, my curiosity stayed under control . . . until I came across a collection of match grade pellet pistols. I was checking out some of the best European pellet pistols, when I discovered that they have developed into absolutely awesome shooters. After reading everything I could find, I couldn't resist buying the pistol below. It's the Baikal (pronounced bi-cal) Model IZH-46M, and it's made in Russia. This is a single shot, single pump pneumatic, match grade .177 caliber pellet pistol. It's capable of shooting perfect scores right out of the box. This type of pistol will do more to increase your shooting skill than anything you can imagine. There are no American made pellet guns that can compare to the quality of this one. Top quality pellet pistols are very popular in Europe and Australia, partly because the people in these countries have allowed their government(s) to confiscate their "real" firearms. Our friends in Europe and Australia never saw it coming. They were sure that it could never happen to them. Here in the U.S., most shooters don't realize that we have the exact same type of bad legislation being pushed at us - every single day of the year. If we don't communicate more often with our elected officials - we'll soon be in the same boat. Unfortunately, we have too many fellow Americans that are willing to just give our Second Amendment rights away. Back to my story . . . my first try at shooting pellet pistols in competition was around 1960. I soon discovered that most pellet guns have a huge accuracy advantage over any BB gun. Back then, we used fairly good quality, CO2 powered Crossman pellet guns. The YMCA built a nice indoor range for us in the basement of a local church. It was equipped with well lit targets, individual spotting scopes, and motorized target carriers; so you never had to go downrange to examine or change targets. That was pretty cool, but you usually had to wait way too long for your chance to shoot. I soon lost interest in indoor ranges that are open to the public. 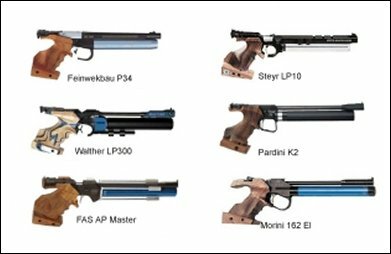 Most of the German and Italian pellet pistols (shown at the right) are close to the $2,000 price range. They are powered by using a scuba tank to charge the large tube below the barrel. I saw a few of these pellet pistols at the last few Shot Shows. The Europeans spare no expense in making the ultimate quality pellet pistols. These target pistols are capable of measuring the ability of any shooter . . . leaving no excuse for equipment problems. I really appreciate firearms that are extremely accurate. You never need to assemble handloads with a pellet gun. You're always ready for shooting, and you don't need to drive to the range. When the conditions are right (when you're home alone), just lock the doors to your indoor range (the house) and you can practice until you're worn out. Getting back to my new Russian pellet pistol I recently purchased . . . . It's a spectacular shooter! Comparing this to an American pellet pistol is like comparing a Ferarri to an old AMC Gremlin. Most American manufacturers are convinced that the average American shooter has no interest in pellet pistols and would rather shoot a .44 Magnum than spend good money on a dinky little pellet pistol. For the more serious shooters out there. . . . this match grade pellet pistol has a fully adjustable two stage trigger (that I set at a crisp 3 ounces). The rear sight has micrometer adjustments. These are the best sights I've ever seen on a pistol. The adjustable grips are also the most functional grips you will ever find. This pistol is designed to shoot in Olympic competition, with the ability to shoot 5-shot groups that look like a single .30 caliber bullet hole. When I heard that this particular model will occasionally beat the high priced German pistols . . . that was all I needed to break out the ol' Mastercard. The Baikal IZH-46M pistol is great for cabin fever, because you can actually practice with it in your house or garage. You only need 33 feet (10 meters) to have a regulation distance range just like they use in the Olympics. An old phone book works fine for a backstop. The NRA 10 Meter Pistol Target (B-40) has a black bullseye that measures just over 2 1/4" and the 10 ring is just 1/2". If you think that's easy, just give it a try. Air pistol competition is tough, but it's a lot more forgiving than the air rifle targets. The regulation size NRA Rifle Target (AR-5/1) has a black bullseye that measures just over 1 1/4" in diameter. That sounds reasonable for a target that's only 33 feet away. However, for your shot to score a 10, you need to hit the small dot in the center of that bullseye, which only measures .050" (that's the same size as the head of a pin). If you miss that (don't worry) you can still score 9 points if you can hit the 1/4" ring around that small dot. If your shot goes just outside of the black, the best score you can hope for is 3 points. Yep . . . that's a pretty tough target, and top quality air guns have the ability to shoot perfect scores all day long. There's no better way to improve your pistol shooting. The Baikal ModeI IZH-46M comes with a cleaning rod, instructions, special tools, and a selection of different size front and rear sights. This tack driver is a great deal, and it retails for about $450. I used to be able to sell these to shooters for $350. (with free shipping). However, the importer I used decided to discontinue importing this model due to a recent 30% price increase. Keep an eye on the home page of this website, and you'll see when I can get access to another good deal on them.